For most people who believe in a god, a myth is what someone else believes while religion is what they believe. They further use the terms pagan and heathen to signify people who believe in myths. But there can be no doubt that the quote listed above is accurate. From its very origins, Christianity borrowed from the surrounding myths that it encountered. When Christianity became the state religion of the Roman Empire in 381 CE, it started to spread outward more rapidly in the centuries that followed. Each of the cultures that Christianity encountered had their own gods, beliefs, symbols, celebrations on specific dates, and other rituals. The choice Christianity had to make was to ignore them, appropriate them in their entirety, or modify them to suit its needs. Christianity often chose the latter. This post examines examples in five areas where this took place: seminal tenets of the faith, rituals, characters, physical locations, and specific dates. One of the central tenets of Christianity is the death and subsequent resurrection in three days of Jesus, the son of god. Yet the resurrection of a god is hardly unique to Christianity. Dying and rising gods trace a long history likely based on the earth’s cycle itself where winter sees plants die off and spring sees them sprout again. There is also a natural occurrence of a three-day period with the waning of the old moon before the new crescent appears. These themes are present in many of the mystery cults that were practiced before and during the growth of Christianity. Attis, the son of Cybele, brought to Rome from Anatolia, was celebrated in great processionals until 268 AD according to Merlin Stone. She further states that Attis “was first tied to a tree and then buried. Three days later a light was said to appear in the burial tomb, whereupon Attis rose from the dead, bringing salvation with him in his rebirth.” In the first century, the Greek cult of Orpheus was another mystery cult gaining followers in Rome. 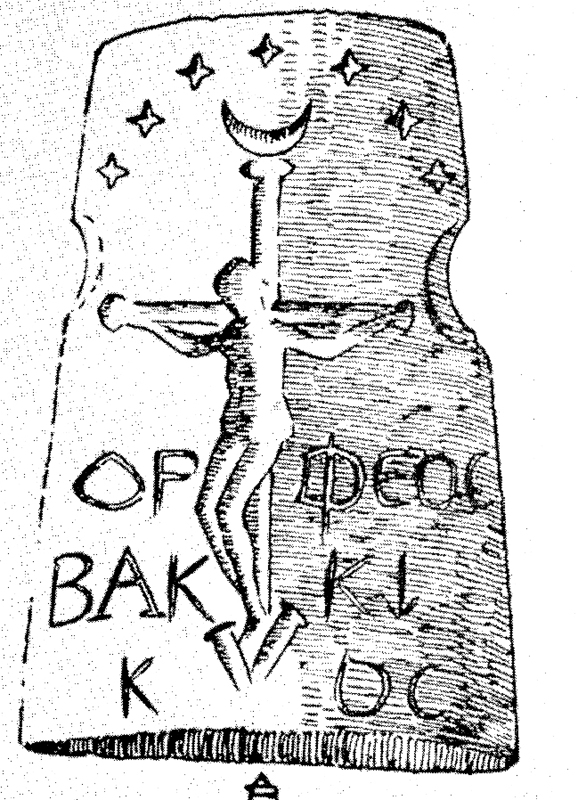 Leonard Shlain claims that in the catacombs of Rome, “the Christ figure [appears] in postures indistinguishable from Orphic iconography.” Featured below is an amulet of the “Orpheus-Christ-Bacchos crucifixion.” Of course there is disagreement about these examples. Christian apologists say the death and resurrection of Jesus was unique. Mythicists, those who believe Jesus was not even a real person, use these examples to prove their point. Baptism is an important ritual in Christianity. The Catechism of the Catholic Church states that “Through Baptism we are freed from sin and reborn as sons of God; we become members of Christ, are incorporated into the Church and made sharers in her mission.” Rituals with water are also common in other faiths. In Greek mythology, Thetis dips her son Achilles into the water of the River Styx which was supposed to have magical powers. But she missed his heel, thus the expression “Achilles heel” for vulnerability. Hindus wash themselves in the Ganges River at certain ceremonial times of the year. Very similar to the purpose of Christian baptism, they believe that it washes away their sins. Instead of at birth, they perform the ceremony every year. The three wise men or magi who came to portend the future birth of Christ were given the names of Melchio, Balthasar, and Gasper in medieval times as the Bible does not name them. Magi are part of the Persian belief in Zoroastrianism. Today’s word magic is related to the powers they possessed. Kenneth Davis in his book Don’t Know Much about Mythology states they “would keep watch until a great star would appear signaling the coming of a savior. Many of the Catholic Saints, such as Radegund, Milburga, Macrine, Wilpurga were named after grain goddesses. In a previous post, I told the story of Radegund. In this legend, Radegund passes by a farmer and tells him to say to anyone that follows that he has seen no one since he sowed his field. As Radegund leaves the crop sprouts and grows to full size. When the men arrive at the field, the farmer tells no lie when he repeats what Radegund told him to say. This is similar to many other myths about the grain goddess. I had the opportunity to visit the Cathedral of St. Clemente in Rome. 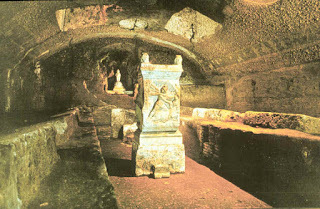 The structure where worship occurs today was built just before 1100. But as you take the stairs you descend to a 4th century basilica that was the converted house of a Roman nobleman. What is really amazing it that when you keep descending, you see what archeologists have uncovered and preserved - the altars involved in the worship of Mithra(s). See picture below. The Council of Nicea in 325 established the date of the celebration of Easter as the first Sunday following the full moon of the spring equinox which was a date celebrated in several pagan religions. Why are eggs associated with this holiday? Because it is based on Eastre – a goddess of spring. What better way to celebrate the rebirth of spring than with eggs and bunnies! One theory of the date of Christmas, December 25 is that it is based on the Winter Solstice and the ancient Roman festival of Saturnalia. This date was not fixed as the birth of Jesus until the reign of the first Christian Roman emperor, Constantine, in 336 CE. Saints were often associated with dates, characters, and symbols of pagan practices. Some surmise that the pig is associated with Saint Anthony because of the sacrifice of the pig in the pagan celebration of Carnival. Carnival was a religion that preceded Christianity whose calendar was based on periods of 40 days. It is interesting that Lent is forty days before Easter and Ascension is forty days after Easter. 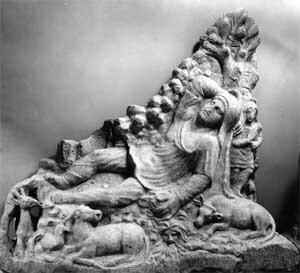 Lent prohibits the consumption of meat eating and may have been established to “exorcise this pagan figure as well as the table customs she encouraged.” The goddess he refers to is Carna. Halloween is still celebrated today, but has come under some prohibition in certain Christian faiths and rightly so as it was based on the Celtic festival of Samhain when “people would light bonfires and wear costumes to ward off roaming ghosts.” Pope Gregory III made November 1 All Saints Day to honor the saints, thus October 31 became “All Hallows Eve” which of course we now know as Halloween. This is just a small sampling of the similarities between Christianity and the other religions and practices it supplanted. Kenneth C. Davis, Don’t Know Much about Mythology (New York, NY: HarperCollins Publishers, 2005), 182. Merlin Stone, When God Was a Woman (New York, NY: Houghton Mifflin Harcourt, 1976), 146. Leonard Shlain, The Alphabet Versus the Goddess: Male Words and Female Images (London, England: Penguin Press, 1998), 229. Kenneth C. Davis, Don’t Know Much about Mythology (New York, NY: HarperCollins Publishers, 2005), 169. Philippe Walter, Christian Mythology: Revelations of Pagan Origins (Toronto, CA: Inner Traditions, 2006), 4.